Dwight Howard, the NBA's first player-coach-GM-CFO, may be limping around Beverly Hills. But that doesn't mean that he's not still doin' work: today the Magic announced that Stan Van Gundy has been fired, and President of Basketball Operations Otis Smith is peaceing out as well. That brings Dwight's front office body count to three. Thus ends the most abusive player-coach relationship since Latrell and P.J., one that culminated in a press conference more physically painful than any throttling. The Magic had to do this, of course. They still hold out hopes of getting Dwight to re-sign, and that wasn't going to happen with Stan Van still running things. Dwight's a rare superstar, whereas Van Gundy is just a very good coach. Coaches, with the exceptions of Pop and Doc, are replaceable. You can make the playoffs with Howard and, say, Mike D'Antoni. You can't with Van Gundy and Ryan Anderson. But here's the thing. Van Gundy was Alex Martins's only bargaining chip. The Magic didn't get better at the trade deadline. It's going to be hard to get better in free agency. 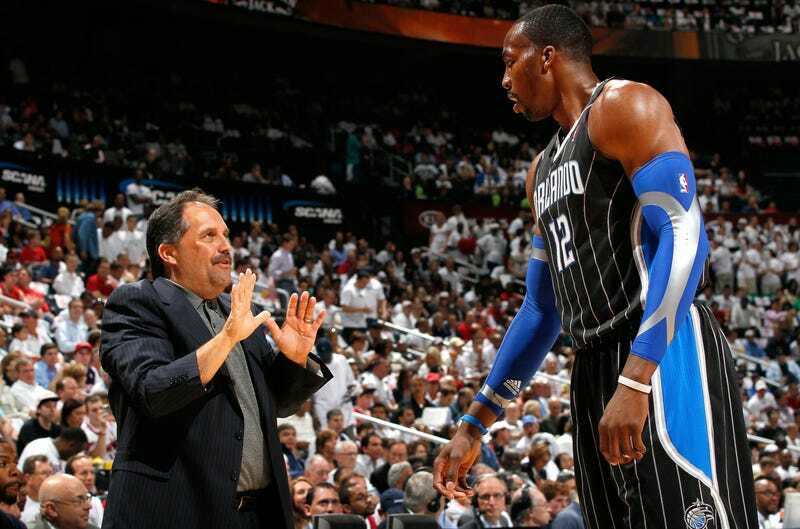 Van Gundy's continued employment was the only leverage the Magic had in contract negotiations with Howard. That was the thinking in March, at least, when word leaked that the team promised "that Howard can decide the fate of both Smith and coach Stan Van Gundy at the end of the season if he signs an extension." Well, here we are, and no extension. Orlando keeps moving the goalposts for Howard, and it's gone from a quid pro quo (We'll do what you want if you agree to stay) to an act of faith (We've done what you want, and we're still hoping you'll stay). Best of luck, I suppose, to Alex Martins and Rich DeVos and Magic fans. Sola fide remains when works fail.